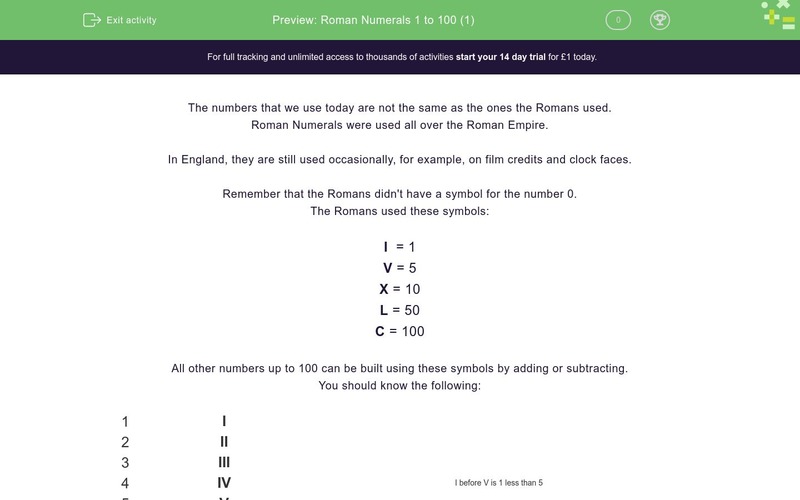 In this worksheet, students must convert Roman Numerals to normal numbers up to 100. The numbers that we use today are not the same as the ones the Romans used. Roman Numerals were used all over the Roman Empire. In England, they are still used occasionally, for example, on film credits and clock faces. Remember that the Romans didn't have a symbol for the number 0. All other numbers up to 100 can be built using these symbols by adding or subtracting. We build bigger numbers by adding 10s or Xs in Roman Numerals. Convert XCIV and LXXIX to normal numbers. For what number does this Roman Numeral stand? Match the numbers to the Roman Numerals.